We have been trying to contact Mrs J Van Niekerk to thank her for her generous donation to Cats'9Lives but the cell number given on the Bank form is incorrect. Want to get involved, why not volunteer by becoming one of our foster moms? 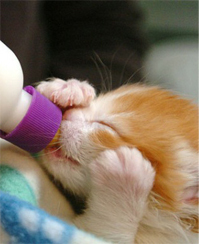 We provide the milk, pellets and take kittens in to be homed when they are old enough, but bottle feeding is a most rewarding job as it is so worthwhile to watch their development. Like dogs, cats are digitigrades, meaning they walk directly on their toes, the bones of their feet making up the lower part of the visible leg.